Small, simple and effective, the Handy Sweeper is the ultimate crumb cleaner, and so much more. Get one to quickly remove small bits of food from a tablecloth, but then keep it around to discover the wide variety of other stuff it can clean. Whether you are sucking up popcorn pieces after a family movie, sweeping away messes from around your cat's litter box, or quickly sprucing up the passenger seat of your car before going out for the night, this little tool will make the job effortless. Thanks to advanced, dual cleaning ability, you can even pick up microscopic bits of lint and pet hair by flipping to the red side. The Handy Sweeper is the perfect size to fit in the palm of your hand, and because it's so compact, you can easily store it in a convenient location. 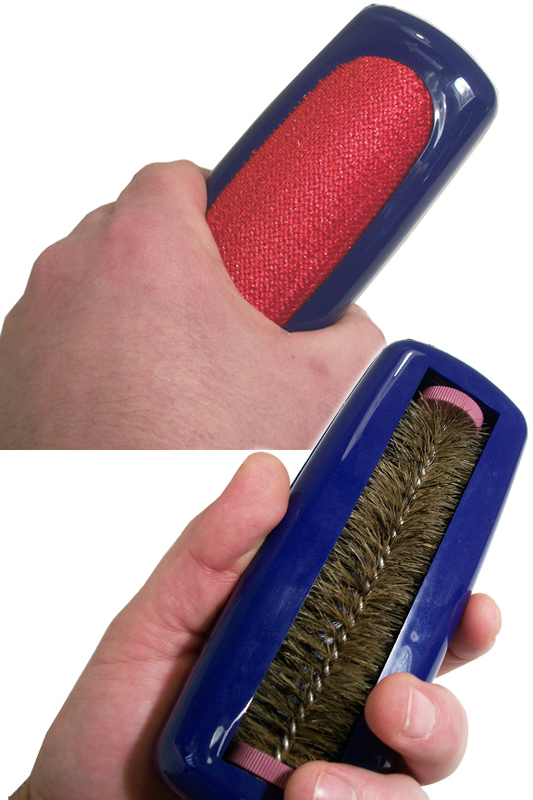 One side has a rolling brush at the center for picking up large chunks, and the other side is covered with a reusable lint brush for tiny stuff that doesn't get sucked up by the rotating bristles. The entire body of the tool acts as a storage container for the dirt you collect, and as you move back and forth over dry debris, it will quickly lift up, and roll right into the chamber above. When the mess is gone, simply pop it open and dump your collections into the trash. The whole thing is also top rack dishwasher safe, so if it gets yucky looking over time, just pop it in to get it clean. 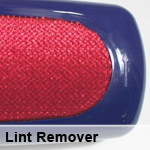 Lint Remover - Other hand-held sweepers can only manage larger pieces of dirt. With the advanced, dual sided cleaning ability on this one, no particle will be too small. Use the standard sweeping side to pick up larger chunks like kitty litter and table crumbs. When you encounter tiny stuff like lint and hair, simply flip it over and use the red side instead. 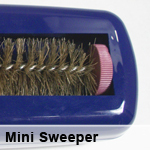 Mini Sweeper - It may be small, but this rolling sweeper is packed with plenty of power. Use it in either direction to quickly pick up a wide variety of dirt and debris. 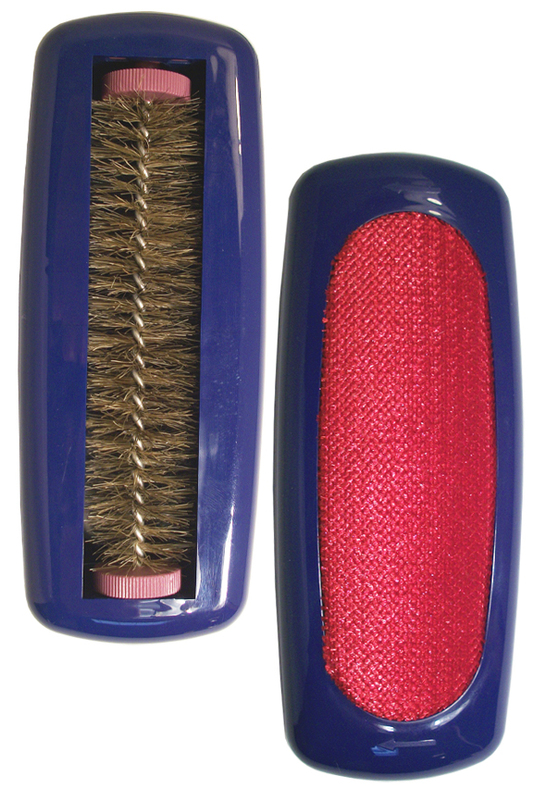 The long lasting roller is held securely in place, and it's loaded with tons of bristles to make cleaning easy. A metal core ensures durability, and the advanced design allows you to roll over small spills, little messes and accidental droppings to lift them up, and lock them in. 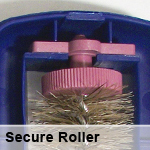 Secure Roller - When looking at similar items, the rolling sweeper is often a problem because it can slip out of position or get stuck to result in failure. This one has a special deign to ensure that the roller is always positioned in the perfect spot for cleaning, and it will never fall out or stop moving. It fits perfectly in its place, and while using the tool, it will roll effortlessly across any surface. Ample Storage - Cleaning up is bad enough, but it's even worse when you have to stop frequently to dispose of the dirt. Although this sweeper is mini in size, it does offer quite a bit of storage space. Rolled debris will be collected in the container above, and you can easily clean the whole mess without emptying it. When it does get full, just pop it open, and dump it out. Quick and painless. 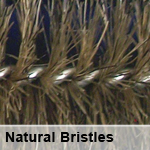 Natural Bristles - Thick nylon bristle will do the job, but not as well as the dense collection of natural bristles on this roller. The thinner material allows for more bristle per square inch, but they also perform better due to the material. Instead of going over an area multiple times to get it clean, make a single pass to collect every last spec. High Quality. Superior materials and improved construction allow this tool to work better and last longer than other versions available. Dual Sided. Perfect as a hand held sweeper, but with the added lint remover, this tool becomes even more valuable. Roll along to collect most of the grime. When tiny particles are left behind, flip to the red side to make them disappear. Versatile. Lift up a wide range of debris using this tool. With dual cleaning ability, you can easily clean dog fur, bread crumbs, cat food and other stuff off almost any surface. Fast And Effective. It only takes a few seconds to clean with it, and the results are amazing. A single swipe can eliminate sm,all messes, and for larger ones, two or three usually does the trick. Long Lasting. Use it over and over again, and get the same great performance for years to come. It's totally washable when it gets too dirty, the bristles won't warp or break, the lint remover is fully reusable, and thanks to sturdy construction and top quality design elements, it will not fail or lose effectiveness with repeated use. The Handy Sweeper is kind of like a hand held vacuum, and it works perfectly for all of those jobs where larger tools become a problem. It doesn't operate with batteries or electricity, but a simple manual action will give you plenty of power to get the job done. 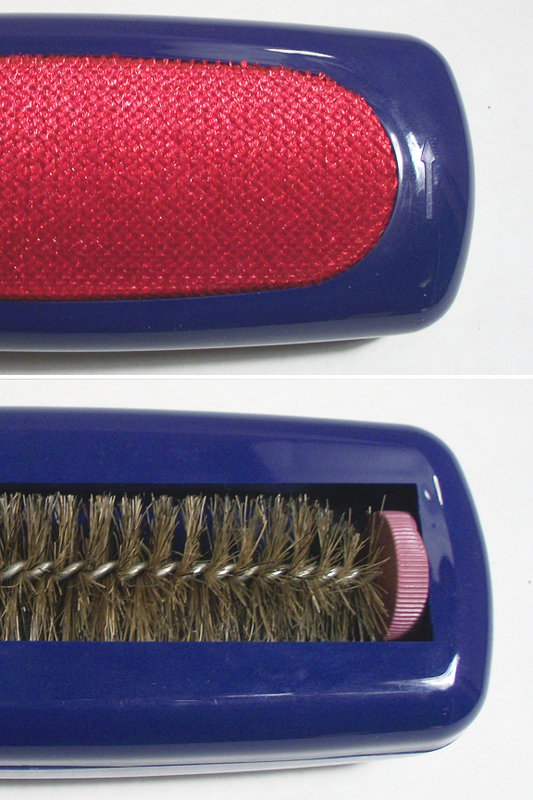 The natural bristles make it work well, but they also allow it to be safe for use on any surface. As the roller spins the bristles will gently skim by to collect debris on carpeting, stairs, upholstery, table cloths, vehicles seats, bedding, hard floors and more. Use it to clean up crumbs, paper clips, thumb tacks, nuts & bolts, nails, broken glass, chips, crackers, dirt, sand, lint, gravel, small toy bricks and so much more. Restaurants & Homeowners: Use to clean up table linens without washing. A quick back and forth motion will pick up crumbs and other debris to allow for further use of the table. Pet Owners: Use to eliminate spillage around the kitty litter box, or use to pick up pieces of kibble around your dog's food bowl. Use the lint remover side to get fur off clothing and furniture quickly. Crafters: Use to sweep up thumb tacks, buttons, sequins, small pieces of paper, clips etc. For accidental spills, a pile of small parts can be rolled up quickly, and then deposited right back where it came from. Handy Men & Women: Lift up nuts and bolts or nails when they spill to never lose hardware. Easily separate from other debris unlike larger brooms and sweepers. Vehicle Owners: Great for car and truck clean up on flooring and seats. Remove crumbs and other small chunks without dragging out the large shop vac. Works in a similar fashion for boats and RVs too. Use the red side to get dog hair and lint off your seats. Moms and Dads: Use with snacking toddlers to pick up the food they drop and put it right back in the bowl. With a clean handy sweeper, you can scoop up just the food, and then open it up to pour it right back where it came from. Everyone Else: For snacking adults it is perfect for next to the couch or on a bedside table. Eliminate cookie crumbs and stray bits of popcorn in order to destroy the evidence. Using this tool is easy. 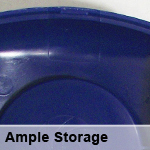 It's basically a compact dirt storage container with cleaning tools on the top and bottom. It's small size makes it comfortable to hold, but the clever design also allows for ample storage. On the underside you will see a roll of flexible bristles that spans the entire length, and sticks out about half way. 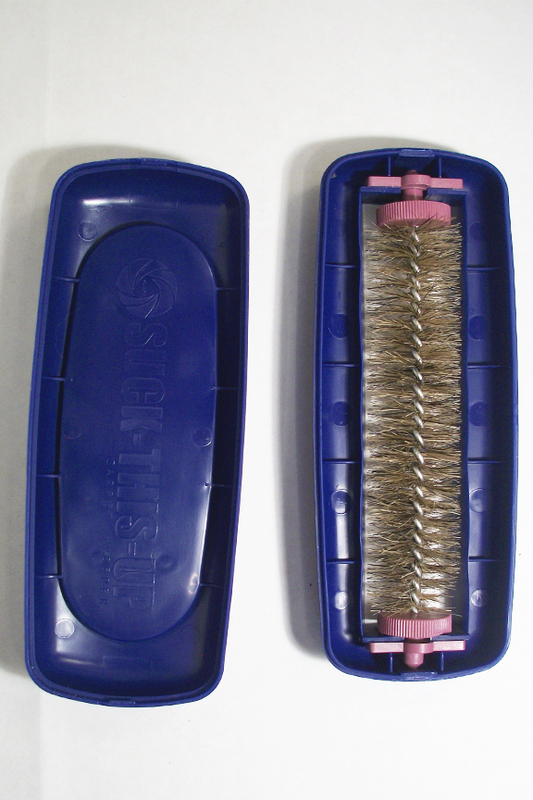 The other half of the bristle roll is hidden inside the container, and this is key to how it functions. As you roll the Handy Sweeper over chunks of dirt, the bristles will spin to lift up and grab those little bits of dirt. As it's lifted up into the container, all of the dirt will be deposited inside, and away from the roll. For smaller debris, use the red, lint remover side in a continuous direction to clean it with ease. This tool is designed for use with pieces that are dry, but will work on wet stuff too. Light pressure will give best results for larger objects, and increased pressure will improve performance for smaller ones. To clean using the roller, use a simple back and forth sweeping action. It will lift up dirt while rolling in either direction. To clean using the lint remover, brush in the direction of the arrow. This material only cleans in one direction, but it will lift up every spec of lint and fur it moves over. Results will vary slightly based upon surface type, but it will be effective no matter where you use it. When the storage container is full, simply separate the two halves, and tip it over to dump it out. The two pieces come apart easily, and then snap together securely after emptying. When in constant use, or certain debris makes it really dirty, just pop it in the dishwasher for cleaning. Similar products have been sold under the names Fluppi, Handi Vac, Crumber, etc. If you compare any similar products, or even ones that are much more expensive, the Handy Sweeper will always be just as good or better when it comes to performance. It's the perfect tool for small messes, or to keep with you so that you can clean up debris at any time. For volatile dirt like glass and gravel, it allows you to clean it up without worrying about damaging expensive equipment. This teeny sweeping tool fits conveniently in a glove box, purse, carry-on bag, apron or even your pocket. Keep one close at hand for when the kids make a mess, or stow one in your vehicle to remove crumbs and food particles from upholstery on the go. It's so small, portable, and convenient that it makes the perfect travel companion. Because it works in both directions, you can clean any mess in half the time. Everything will be brushed up quickly, and then stored inside the tool. One of the main benefits of using this small sweeper instead of a larger power tool is that you are not forced to throw away what you clean up. All of those nails and screws can go right back into your tool box, and that special little Lego piece will be there when you need it! This amazing tool has proven to be indispensable for car trips, irreplaceable for home cleaning, and unmatched for convenience when cleaning messes at the office. It has been used by restaurants to speed up table clean up, by pool halls to care for billiard tables, by homeowners for quick carpet and furniture clean ups, and by car, boat, and RV owners for a take-anywhere portability. It makes a wonderful gift for a new home owner or your favorite traveler. The Handy Sweeper will work its magic for years to come without any maintenance, and at such an affordable price, it makes sense for any home. It's guaranteed to work right out of the package, and it will keep on working for as long as you own it. Dimensions 6.5" x 2.8" x 2"
Uses Use as a crumb sweeper and so much more. Quickly pick up large or small debris on any surface. Use to clean the seats in your car, the dining room table, counter tops in your kitchen, or the desk in your office. Roll over any type of dry mess to sweep it up into the container for collection. Flip to the red side and quickly eliminate lint and hair from clothing and upholstery. Color Varies - For specific choice, use the comments box at checkout. We will do our best to honor any color choice as your order is packaged. Integrated Storage Yes - Ample storage space is located above the roller to keep cleaning without stopping. Dual Sided Cleaning Yes. Find a lint remover on one side and a powerful hand held vacuum on the other. Secure Roller Yes. Locked in place to improve performance, and prevent failure. Compatibility Safe for all surfaces. Use on carpet, wood, tile, metal and more. Works on larger, heavy objects like nuts and bolts, and works on smaller light particles like crumbs and dirt. With the red side, you can get super small stuff like lint and fur. Quickly and easily clean up little messes almost anywhere. This hand held sweeper is easy to use and works great for all sorts of messes. Simply roll over dry debris to pick them it and lock it inside the tool. Once the area is clean, pop the container open to dump your mess into the trash. Order Yours Today! This little sweeper is the best! It has saved me so much time & effort.... no longer need to bring out my big vacuum cleaner to keep up with all the little every day crumbs (and cat hair/catnip). Bought this recently. Thought it would be a little smaller. I am using it to carry in my purse. So it takes up more space than I thought but is still usable. Also the bristles on the sweeper could be a little stiffer. But otherwise it seems to be pretty good quality & inexpensive. Item is good except very difficult to open up and clean! Handy Sweeper was not as efficient as I had hoped. Difficult to take apart to empty without spilling the contents it just picked up. I buy anywhere from 5-15 at a time and there is always something wrong with at least 1, but other than that its a very good product that comes in handy. This item does a fair job, but the bristles need to be stiffer. It tends to leave smaller items because of this. I had one with stiffer bristles and it picked up everything from bolts to fingernail clippings. For the price it's still a good buy. This little sweeper is great. I use it to clean my work van and it really picks up the dirt. Car wash vacuum cleaners often don't work and recharge types often konk out after a short time so this is ideal for me. I may order one or two more for my personal car and house at some point. Works well on the lint side, the brush side doesnt hold much and if you tip it, all the dirt just falls on the floor. Works great, to control kitties air as he distributes through the house. they work great, cleans pet hair right off the seats. It is ideal for the small jobs we wanted. I got several similar sweepers at the fair many years ago, but have been unable to find them since. Partly because I didn't know what to call them. I found yours, and I'm really happy. They pick up cat food really well. The lint sweeper side was an added bonus, really worked on my stairs! Bristles are very soft and not strong enough to actually "sweep" anything up - back side of sweeper is fine for getting hair off of furniture. The opening is Too narrow for a proper cleaning. Handy Sweeper is what any maintenance or housekeeping personnel should always keep on hand for quick clean ups, I find it works well even for plaster dust. The sweepers arrived in a timely manner and were as pictured. They work great. They really pick up just about anything you need to sweep up. My only concern is that on of the 'roller holders' has already broken and is now unusable. simplygoodstuff response: Your experience with the 'roller holder' part is not common. It sounds like you may have received a defective item, so please contact us for a replacement. Easy to use and actually works. It works really well to pickup the never-ending pine needles on the carpet. However, I haven't figured out a way to open and empty it out. I'm not sure it even does open. That is the one disappointing thing. It works quite well. It took me a bit to figure out how to open it (there are tabs beneath the directional arrows on each side) and the first opening was stiff, but it picks up the crumbs very nicely. My family was up visiting and they were impressed, now my sister is going to order one too. Very handy! Does the job! Great value, especially if you buy at least 6, like I did. I gave them to family members at Christmas, and it was a big hit! Not only is the Handy Sweeper useful to clear crumbs off a table or spot check a floor, the other side serves as a lint remover on clothing and cloth furnishings. Best price for a very practical product. Definitely love how the hand brush works! Exactly what I need for the desk I share with the Crumb Queen at work. Love it already. This product works great! Makes cleaning up small messes so easy. And it works great on office chairs. Love it. This handy dandy little item is wonderful for picking kitty litter up from carpet. There is always kitty litter on the carpet around my cat's litter box and this little Handy Sweeper easily picks up all the litter and I don't have to vacuum so frequently. I bought this to pick up stray kitty litter. It handles that very well and so much more. This little sweeper is a delightful surprise. These little sweepers are very handy for quick pick-up of dirt and fine debris on my auto carpets. I keep one in each car. My nephews little boy broke my old crumb sweeper. This one is even better! Ordered 2 so I could keep a spare! simplygoodstuff response: Sorry to hear of your disappointment. It sounds like you might have a defective one. Please give us a call when you get a chance. We would be happy to replace it for you. It's very good product with affordable price. Thank you. Excellent! I gave these out as a little something extra for Christmas and everyone loved them. I love this little sweeper! I offer pretzels for students at my tutoring center, and inevitably some end up on the floor. I put one of these in each tutoring area and kids MUST use it to clean up the floor before they leave (and before the pretzels get ground into the carpet). They like doing it . . . may even be spilling on purpose!? One even asked if he could earn one for his next prize! This is exactly what I was looking for - I have an old one from the 70s and my friend wanted one just like that. Thanks to your website I found it - item received in perfect conditions and very fast shipping - Thank you! I initially bought this to pick up the hulls and seeds on the wood floor around my bird's cage. Unfortunately, it doesn't do a good job of that. HOWEVER, I found that it is EXCELLENT for picking up crumbs and lint off of my microfiber sofa and fabric car seats. It was my biggest pet peeve because everything sticks to that kind of fabric, and it's hard to brush it off with your hands. This little plastic sweeper lifts stuff right off. I love it! We can offer extremely reduced pricing for large quantities, but exact price would be dependent upon exact quantity. Please give us a call to get a quote. 7 of 8 Customer(s) found this Answer helpful. Does this work on pet hair stuck to carpets & upholstery? Yes it does. Make sure to flip it to the red side first, and ensure that you move in the direction that the arrow indicates. Simply swipe over the surface to pick up teeny tiny stuff like hair and lint. The sweeper side is better for larger debris. how exactly does it open? Where are the catches? I've been pushing and pulling, but it's holding tight. I'd hate to break it, it seems to be sweeping well. If you stand it on end, there will be internal catches at the top and bottom. Press down on the outer shell with your finger or thumb on the roller side to depress the tab, and release the catch. Once you do this, the top and bottom will separate easily. It may be tough when it's brand new, but after you open it once, it will be easy to repeat. The product itself weighs 3 ounces. It is possible, but it's not a service that we provide at this time. Long Reach, Curved Wand And Fireman Style Hose Nozzle Combo.